A racetrack is the setting for murder. But not your typical murder. This killer is killing the horses. It’s up to Lawyer Dan Morgan and an unlikely assistant to find out who before the owner of the track is put out of business. A.J. Kaine – A young boy, with a unique gift. I found this story intriguing. I wasn’t sure at first how much of a mystery there could be on a racetrack. Steve O’Brien managed to write a story that surprised me. There’s quite a bit of action, suspense, and a nice blend of bad guys. There’s quite a bit of violence in this book, so it’s definitely not geared towards young readers. 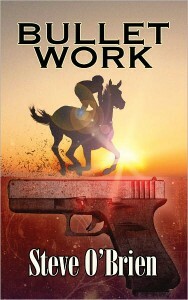 However, for those into mysteries, or those who love stories about horses, I’d recommend you check this out. There are some very nice action scenes, and the reader develops a real bond with the animals, and with A.J. throughout the story. Check it out if you get the chance. It’s available from major bookstores, in adddition to being available for the Kindle, nook, and other e-readers. I really think you’d enjoy the story. 6) Contest will continue until May 4, 2011. 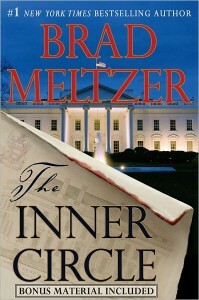 In a vein similar to the works of Dan Brown, Brad Metzer’s Inner Circle covers a conspiracy going back to the founding fathers. The story revolves around a dictionary reported to have been owned by George Washington. A curator at the National Archives finds the dictionary and along with a former high school crush is involved in web of intrigue. Their objective is to find the secrets to a secret organization, before the organization finds and eliminates them. This book to me was just okay. There were a few areas where things felt broken and didn’t flow right. Also, I’m not sure even having read it, what the big secret was supposed to be. I haven’t read any of Mr. Meltzer’s other books, but quite frankly, after reading this one, I’m not sure I’d be interested in the others. I had high hopes for it, based on the synopsis I’d received but it failed to draw me in like I thought. Due to some strong language and adult violence, I’d put this in the older teen to adult market. I can’t fully recommend it. It was good, but not great, so buyer beware, or better yet, maybe get it from the library. *Disclaimer* A special thanks goes out to Brad at Hachette Book Groups for a review copy of this book. It in no way influenced my review. You can discuss it here or join my facebook page and discuss it there. 6) Contest will continue until May 3rd 2011. A serial mad man is terrorizing New York City. Michael Bennett is called in from his family vacation to track down the madman. In the fourth outing in the Michael Bennett series, James Patterson again has a character that I love to read. I enjoy Bennett’s familly relationships. I also like the fact that Bennett has his own flaws. The characters are well developed throughout this book. The story keeps a brisk pace that hardly gives you room to breath as you read through it. If I had one problem with the book it’s that Mr. Patterson seemed to break one of the rules of writing thrillers/mysteries, and that was don’t trick the reader, and there was one event in this book where I indeed felt like I’d been tricked. I won’t go into details, so I don’t spoil it, but I figure you might feel the same when you read it. That being said, it didn’t ruin my enjoyment of the story. I still liked the book, and the climax, was what I expected, but I would have liked to have seen it go on a little longer. There was some strong language, so definitely for older teens and adults. 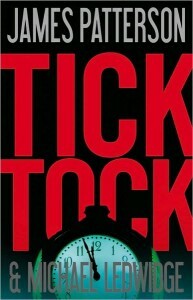 All being told, if you like James Patterson, then I’d pick up Tick Tock. But Hurry. Times Wasting. After tragedy strikes the island of Jamaica, two brothers take it upon themselves to discover the cause behind it. At the same time, a youg woman begins on her hero’s journey to discover the same answers. Kenyatta – A warrior, he was last seen in Echoes of Shattered Age. Kita – Also a warrior, Kenyatta’s brother. Seung Yoon – A young woman on a journey of discovery. This book was pretty exciting. The first one in the series was a smaller, more intimate scale. This one covers a broader range. While Mr. Terrell’s first novel was akin to Kurosawa’s Hidden Fortress, this one would be similar in nature to Tolkien’s Lord of the Rings with a pacific/asiatic twist. The time is a period after technology ceases to exists. Magic, and the tools of ancient martial warriors are in abundance. A Tidal wave destroys the Jamaican home of one of the brothers. They set out on a quest to discover what is upsetting the balance of nature. The course of their quest takes you from Jamaica to a futuristic version of America. In another part of the world, a young female warrior named Seung Yoon sets out on her own mythological hero’s quest. Her journey is not only external, but internal as well, as she uncovers answers to questions she didn’t know she had. If you enjoy fantasy novels and sword and sorcery epics, then I think you’d really enjoy this story. It has a strong plot, and the story draws you into the characters. You get involved in some of their lives, and tense moments occur when they are put in jeopardy. I really look forward to seeing the conclusion of this story, and revisiting with Kita, Kenyatta, Malimokuru, and Seung. I would recommend this for adults or older teens because of violent imagery, and strong situations. 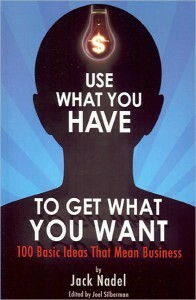 *Disclaimer* A special thanks goes out to RJ Terrell for a review copy of this book. It in no way influenced my review. You can discuss it here or join my facebook page and discuss it there. 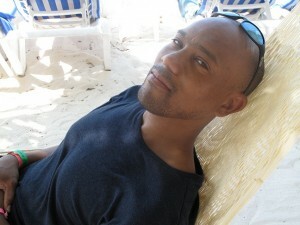 Today we are proud to welcome once again to our pages, R.J. Terrell. R.J. is here to tell us a little bit about his newest novel, Legends of a Shattered Age. Thank you R. J. for taking the time to talk to our readers. Rhodes Review: So what Inspired the scenario played out in this novel This covered an area more like an epic story such as LOTR? RJ Terrell: With this one, I had more experience with writing and was able to see more of what I liked from the first book and wanted to develop more with the second. The other thing was, Echoes of A Shattered Age was an introduction to the World of A Shattered Age, as I call it. Things had to be introduced (and still are) with the first book while still leaving the reader wondering. With Legends of A Shattered Age, the characters are dealing more with the affects of what is going on as a result of the Drek’s activities. This book also delves a bit deeper into some of the characters from the first book as well as the other Races that inhabit the world that humans don’t know about. Rhodes Review: Some new characters were introduced in this novel. Will we see them again in the 3rd story? RJ Terrell: Absolutely! There are several that I’m especially fond of and I believe readers will connect with as well. Many of them will definitely play a part in the next story. Rhodes Review: How have you grown as a writer since the first story? RJ Terrell: *chuckles* Its funny to answer that question. Since the completion of Echoes of A Shattered Age, I’ve had more than plenty of time to step back and assess what my strengths and weaknesses were in the telling of the story. I had to be critical about what I needed to work on, and if what I was doing well truly mattered in the telling of the story. I think I’ve walked away from that analysis knowing how much detail is too much or not enough, and that I also wanted to develop a stronger connection with the characters. I’ve gained a deeper understanding that the reader has to care and connect with the characters. All else is secondary. Rhodes Review: How do you go about writing your books. I’ve taken some classes, and they cover step by step processes, ie. come up with a plot, theme, outline, etc. As far as plot goes, I don’t cover much in the outline for that simply because I already have it in mind and only need a few remarks here or there as a reference point. Theme is something to be careful with. For instance, if a book has a “green theme” the writer will need to be careful to get the message across without coming across as “preachy”. No matter the theme, the writer (in my experience) must be sure to balance it so that there is enough reference to our world to give the reader something to grasp, while at the same time not becoming too rooted in our world and writing a work of journalism instead of a novel. Rhodes Review: What are you currently working on? RJ Terrell: I am currently about 30% into Heroes of A Broken Age, the final chapter in the series. Rhodes Review: Any plans to write in other Genres, or do you plan on sticking with Fantasy? RJ Terrell: For now, I haven’t set my sights on any other genre, but you never know what the future holds. I will say, however, that I’ve had a vampire story clawing to get out of my head for several years now. I’ve been hesitant, with the influx of vampires flooding entertainment media. Perhaps when I finish my current project I may take a step into that world and see what I see. One thing I can say for certain is that I will be creating things from the ground up while doing my best to stick with the traditional lore. It could be interesting. Rhodes Review: Anything going on you’d like to announce to my readers? RJ Terrell: While working on the final novel in this series, I am in the process of re-releasing Echoes of A Shattered Age with the new publisher with which my next two novels, Legends of A Shattered Age, and Heroes of A Broken Age will be released. I’m pushing to have the entire trilogy completed and available by summer this year, so that is an exciting thing for me. I think anyone who has enjoyed Echoes of A Shattered Age will be truly taken by the next entries, as things continually get deeper and the stakes get higher! R J Terrell is a native of California now living in Vancouver BC. If its outside and involves mountains, water and lots of trees and snow he most likely enjoys it. His love of fiction, particularly fantasy, has filled his bookshelves to bursting and has fueled his vigor to join the ranks of the most prominent figures in fiction and fantasy. Those words you read, were Treyvors. 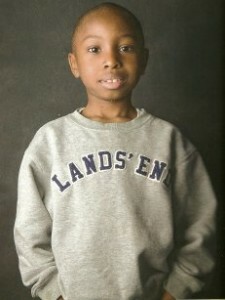 Like so many children in our country, Treyvon has a parent being incarcerated. People think about those being punished, but very seldom think about those they leave behind. In what will happen to me, the authors do just that. They look at 30 children, and the children tell in their words, how they feel. The book also covers the caretakers such as grandparents, who when they should be living their golden years, are left raising another child. The book is a fantastic resource, I feel, for teachers, school counselors, ministerial counselors, and anyone who has to deal with children or families of those in jail. There are additions to the book that list the most common questions children have, and how to answer them, how to deal with the emotions, including grief, shame, anger, etc. A ton of resources and advice, and a bill of rights for children. There is also a section on restorative justice which I found to be an intriguing idea. The basic premise, from how I understood it, doesn’t focus on punishment, but more on justice. Ie. if you steal someone’s car, what can you do to make it up to them. 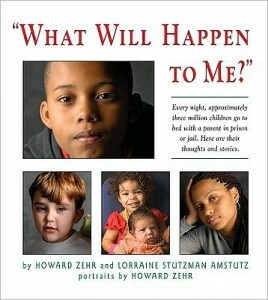 If you are in any situation where you deal with children, I think you should get this book for your library. Even if you don’t pick it up, because the stories may move you to get involved. *Disclaimer* A special thanks goes out to Julie at FSB Associates for a review copy of this book. It in no way influenced my review. You can discuss it here or join my facebook page and discuss it there.